Each packet contains 512 Grams of oxytetracycline HCl (343 g/lb). 23.9-oz packets, packed 24 packets per box. Convenient, cost-effective treatment option vs injectable therapy. 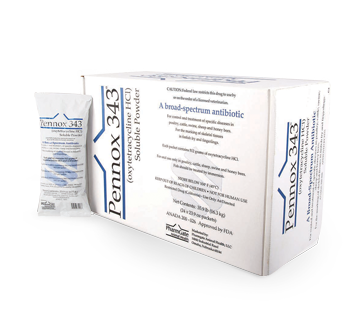 Broad spectrum, effective against both Gram-positive and Gram-negative organisms that can cause respiratory or enteric diseases. Readily absorbed, providing effective blood and lung tissue concentrations. No need for the additional expense of adding citric acid. Highest concentration, 343 g/lb of oxytetracycline HCl. For Sheep: Control of bacterial enteritis caused by Escherichia coli susceptible to oxytetracycline. WARNING: FIVE DAY WITHDRAWAL PERIOD. For Sheep: Control of bacterial pneumonia (shipping fever complex) caused by Pasteurella multocida susceptible to oxytetracycline. WARNING: FIVE DAY WITHDRAWAL PERIOD. A MILK DISCARD PERIOD HAS NOT BEEN ESTABLISHED FOR THIS PRODUCT IN LACTATING DAIRY CATTLE. DO NOT USE IN FEMALE DAIRY CATTLE 20 MONTHS OF AGE OR OLDER. DO NOT MIX THIS PRODUCT WITH MILK OR MILK REPLACERS. ADMINISTER ONE HOUR BEFORE OR TWO HOURS AFTER FEEDING MILK OR MILK REPLACERS. For Calves, Beef, and Non-lactating Dairy Cattle: Control of bacterial pneumonia (shipping fever complex) caused by Pasteurella multocida. CONTRAINDICATION: DUSTING OF UNCAPPED BROOD CELLS HAS BEEN REPORTED TO CAUSE DEATH OF LARVAL HONEY BEES. DO NOT DUST UNCAPPED BROOD CELLS. FOR HONEY BEES, THE DRUG SHOULD BE FED EARLY IN THE SPRING OR FALL AND CONSUMED BY THE BEES BEFORE MAIN HONEY FLOW BEGINS TO AVOID CONTAMINATION OF PRODUCTION HONEY. WARNING: AN ADDITIONAL WITHDRAWAL TIME BEYOND THE GROW-OUT PERIOD IS NOT NEEDED FOR FINISH. ADVERSE REACTIONS: OXYTETRACYCLINE HCl WILL ACIDIFY THE WATER. THE pH SHOULD BE MAINTAINED AT AN ACCEPTABLE LEVEL FOR FISH BY THE ADDITION OF A BUFFER. MONITOR WATER QUALITY AND TEMPERATURE. 0 days for chicken, turkeys, and swine. 5-day withdrawal for cattle and sheep.